You are currently browsing the category archive for the ‘Silly Symphonies’ category. ‘Babes in the woods’ is a free adaptation of the fairy tale of ‘Hansel and Gretel’. In Disney’s version the two lost children encounter some merry dwarfs before they meet the witch. The witch takes them for a ride on her flying broom to her gingerbread house. Once inside the witch’s abode the cartoon takes a nightmarish turn. in the dark and gloomy inside the witch reveals she turns little children in newts, rats, spiders and bats. We watch the with turn a cat into stone, which immediately falls down and brakes. Then she turns the boy into a spider. When she wants to turn the girl into a rat, she’s interrupted by the dwarfs, who have come to the rescue. While she’s fleeing for the squadrons of gnomes firing arrows at her, the girl discovers a potion to turn the spider and all other animals present in the witches house into children again. In the end the witch is turned into stone by falling into her own potion. This re-telling of Grimm’s classic tale introduces some story ideas that made it into ‘Snow White and the Seven Dwarfs’ five years later: there’s a scary forest with trees looking like monsters and there are of course the witch and the dwarfs. Indeed, concept artist Albert Hurter was responsible for most of the looks of both this Silly Symphony as one of the chief designers for Disney’s first feature. The storytelling is economical, with a lot happening in the mere seven minutes. As soon as the witch enters the scene, the action is relentless. The pretty scary scene inside the Witch’s house is particularly gripping. The short also contains a small dance routine, reminiscent of, but a great improvement on ‘The Merry Dwarfs‘ from 1929. The children’s designs of this particular film became stock designs in most studios in the rest of the 1930’s, in which more and more films would take a childish character, anyway. With ‘Babes in the Woods’ embarked on a series of Silly Symphonies that were adaptations of familiar fairy tales and fables. Other examples are ‘Three Little Pigs‘ and ‘The Pied Piper‘ from 1933, ‘The Grasshopper and the Ants‘ from 1934 and ‘The Tortoise and the Hare’ from 1935. ‘Babes in the Woods’ is a stunning tour-de-force for 1932, but four days before its release Disney had started its first in-house art class, hosted by Don Graham. With these twice-weekly art classes Disney’s animators got better and better, and all subsequent Disney films clearly show that, with the Silly Symphonies in particular showing an enormous growth during the rest of the 1930’s. One trivial remark: Hansel and Gretel are wearing traditional costumes typical for some Dutch fishing-villages. However, the landscape looks anything but Dutch (in fact, it looks pretty Mid-European). Talking about being lost! ‘Santa’s Workshop’ is one of the earliest Christmas cartoons, celebrating the Santa Claus myth with glee. If the preceding Silly Symphonies, ‘King Neptune‘ and ‘Babes in the Woods’ were impressive, ‘Santa’s Workshop’ is even more beautiful and colorful. 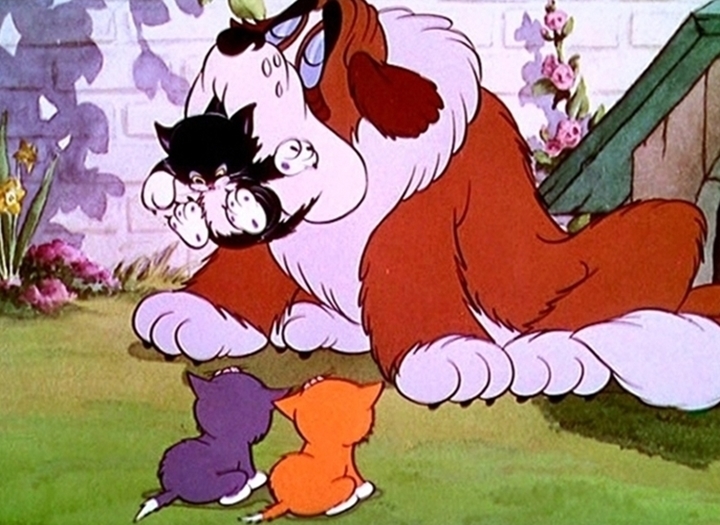 The short’s opening scenes are more colorful than those of the earlier shorts, and this high level of use of color is maintained throughout the picture. Like ‘King Neptune’ it’s an operetta cartoon, with the elves and Santa singing their lines in rhyme. Santa Claus himself is a variation on King Neptune, equally stout and equally merry. We watch him reading letters, accompanied by a sour gnome, who shares his voice (Pinto Colvig) with later famous sourpuss Grumpy from ‘Snow White and the Seven Dwarfs’ (1937). Later Santa test dolls, including a Topsy doll exclaiming ‘Mammy’, referencing to Al Jolson. The sourpuss gnome, animated by Tom Palmer, can be regarded as one of the first animated figures with a character of his own. In his autobiography Pinto Colvig claims that credits should go to Palmer “for being the first to put actual living mannerisms and human-like expressions into film cartoons”, based on Colvig’s own interpretation of the character. The scenes with Santa are followed by a parade of mechanical toys into Santa’s sack, accompanied by Franz Schubert’s Military March No. 1. This sequence clearly shows how good Disney’s animation had become: the difference between living creatures and mechanical toys is unmistakable. This march a.o. features a mechanical Charlie Chaplin toy, and some stereotyped Chinese and Jewish dolls. The racist dolls notwithstanding the complete cartoon is one of sheer delight, and must have been mind-blowing to the audiences of the time, unfamiliar with either color or this level of animation in other cartoons of the era. One can rightly say, that only in color the Silly Symphony series rightly found its purpose of pushing the limits of animation forward. ‘Santa’s Workshop’ itself was proof of the astonishing growth the studio had made in its four year existence. One of the reasons was that since 1931 Disney had sent his animators to evening classes at the Chouinard Art School. But on 15 november 1932 Chouinard art teacher Don Graham was appointed as the studio’s formal teacher, starting evening classes at the Disney studio itself. From now on the studio could improve itself even faster, with the Silly Symphonies as its main platform for innovation, especially from 1934 onward, when Disney planned to make a feature film. By the mid-1930’s the art school cost the studio no less than $100.000 a year, but Disney now could improve the quality of his films at an amazing speed, leaving all competitors far behind. ‘Santa’s Workshop’ was one of the few Silly Symphonies to get a sequel. In 1933 the studio released ‘The Night Before Christmas’, which is even more colorful and more refined than this cartoon. ‘The Bears and the Bees’ follows the adventures of two little bear cubs, who encounter a large mean bear and a bee colony. The two cubs eat the bees’ honey, but luckily it’s the old mean bear who gets all the stings, in an elaborate battle scene, comparable to those in ‘The Spider and the Fly‘ (1931) and ‘Bugs in Love‘ (1932). The story of ‘The Bears and the Bees’ is consistent, but remarkably boring. The two little bears look like early forerunners of Mickey’s nephews Morty and Ferdy, who would make their screen debut two years later in ‘Mickey’s Steamroller‘ (1934). It’s interesting to see how the animators tried to render these two cubs partly as animals and partly as little brats. This way of animating animals halfway anthropomorphism would become a Disney specialty, leading to masterpieces like ‘Bambi‘ (1942) and ‘Lady and the Tramp‘ (1956). In this short it can be watched in its embryonic form. ‘The Fox Hunt’ is the most atypical Silly Symphony of the black and white era. It’s not devoted to music at all, and it features human characters. These human hunters ride rather cartoony horses, and much of the fun comes from the silly ways the hunters ride their horses. One even rides a cow, a pig, a porcupine and a log with four dogs in it. The cartoon opens most spectacularly, with the morning sun’s beaming rays lighting a few forest scenes. A little later there’s a beautiful scene of the hunters and their horses casting long shadows on a hill. A scene like this looks all the way forward to the Ave Maria sequence of ‘Fantasia’ (1940). The human figures are a bit of a mixed bag, but generally more convincing than those in ‘Mother Goose Melodies‘ or ‘The China Plate‘ from earlier that year. Thus, ‘The Fox Hunt’ is one of those films showcasing Disney’s ambition, even though it’s by no means a classic. The fox hunt theme was revisited nine years later in the Donald Duck & Goofy short of the same title (1938), which uses the same skunk end gag, which itself was copied from the Oswald cartoon ‘The Fox Chase‘ (1928). ‘The Clock Store’ was the last of the Silly Symphonies solely devoted to a dance routine. This time, the traditional dance routine is performed by clocks and watches to Frank Churchill’s music. The cartoon ends with two alarm clocks fighting each other to pieces. Unfortunately, before this final scene there is no story, whatsoever, and by now the dance routine had become very tiresome, indeed. Nevertheless, the short is beautifully made: the opening scene shows a lamplighter lighting the street lights to stunning effects. Furthermore, halfway the cartoon we watch two 18th century human figures dancing an elegant minuet. This short dance scene was the studio’s most realistic take on the human form, yet, and a spectacular sight for a 1931 cartoon. Following Van Beuren’s ‘A Romeo Robin‘ (1930) Disney devoted a whole Silly Symphony on birds. The short follows the half-story formula introduced in ‘Playful Pan‘ with the first part consisting of more rhythmical movement to music than real dancing. The film starts with quite uninspired and tiresome gags about several birds moving randomly to music (opening with swans and a peacock moving to Jacques Offenbach’s barcarolle), but after 5’10 these give way to a small story about a baby chick who is taken away by an eagle but saved by a group of small birds. The birds are drawn cartoony and not at all naturalistic. But such naturalism eventually would occur in Disney’s films, within only a couple of years, with ‘Birds in the Spring‘ being the prime example. It’s interesting to compare these two cartoons, which are only two years apart. The comparison makes ‘Birds of a Feather’ look primitive and dated, but even this cartoon knows one complex scene, in which the flock of small birds attacks the eagle. In this scene the movement of the circling birds is animated beautifully and quite convincingly, as well. ‘Mother Goose Melodies’ is one of those Silly Symphonies showing the enormous strides the Walt Disney studio was taking to advance animation forward. The cartoon easily outdoes all its contemporaries. The cartoon is extremely rich for its time, introducing us to countless characters, with only a few being stock models (the spider, some mice and some pigs). Some of the scenes are quite elaborate, like the finale, in which the book collapses and we watch all nursery rhyme figures dancing to the joyous music. But the opening scene, which takes its time to introduce Old king Cole, is the most remarkable: it’s one long parade scene, looping the background, but otherwise remaining fresh by introducing new nursery rhyme characters all the time. Indeed, Walt Disney reused this device (and a lot of its animation) in the color cartoon ‘Parade of the Award Nominees‘ (1932), a special short for the fifth Academy Award ceremony, and in ‘The Standard Parade’ (1939), a commercial for Standard Oil. Moreover, for the first time since ‘El Terrible Toreador‘ (1929) the studio takes its chances at the human form again. And although King Cole and his nursery rhyme friends are no ‘Snow White’, they’re a great deal more convincing than the humans in the earlier cartoon. The designs are more elaborate, and there’s much more sense of weight. ‘Mother Goose Melodies’ is also the very first Silly Symphony to feature singing characters, anticipating the operetta cartoons of 1932-1935. The short simply bursts with ideas, and is a cartoon of sheer joy. On the other hand, it’s just that: by taking the ‘song-and-dance routine’-concept to the max, this cartoon offers singing and dancing only. There is no story, there are no gags, and the short features a lot of repetitive animation. This makes ‘Mother Goose Melodies’ strangely awesome and a little boring at the same time. Nevertheless, the cartoon was so successful, Disney would revisit its theme two times, in the Silly Symphonies ‘Old King Cole‘ (1933) and ‘Mother Goose goes Hollywood’ (1938). A cat is put out. When he tries to catch a bird, he falls down and gets knocked unconscious by a wind-flower. Enter a nightmarish sequence, in which the cat imagines his lives are fleeing him, and that he’s being attacked by giant birds, hooting owls, bats, giant spiders and hollow trees. Luckily, in the morning it all appears to have been a dream. ‘The Cat’s Out’ is not devoid of dance routines (there are two dance scenes featuring scarecrows and a bat), but it has a surprisingly clear story, unmatched by earlier Silly Symphonies. It is arguably the first Silly Symphony with such a clear story, anticipating the straightforward storytelling of ‘The Ugly Duckling‘ of the end of the same year. 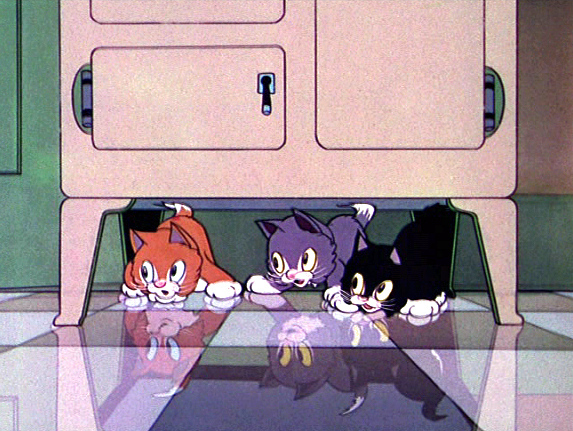 This makes the short one of the most interesting Silly Symphonies of 1931. With his double pipe, Pan makes all animals and plants, yes, even trees and clouds move and dance. The latter cause a fire with their lightning, but Pan lures the flames away to the lake, as if he were the pied piper. Like ‘Springtime‘ (1929) ‘Playful Pan’ can be regarded as a forerunner of Disney’s groundbreaking cartoon ‘Flowers and Trees‘ (1932). The short is especially interesting for the introduction of the anthropomorphized flames, so typical of cartoons about fire. ‘Playful Pan’ is more entertaining than earlier Silly Symphonies, because half way the dance routine gives way to some kind of story, in which fire threatens the forest. This fire sequence is actually rather exciting. The fire itself is well animated, and the flames form a real threat: they do kill a humanized tree, and make all the animals flee. The story formula of ‘Playful Pan’, in which the second half has some kind of story, was explored in many more Silly Symphonies from 1931 (e.g. ‘Birds of a Feather‘, ‘The China Plate‘. ‘The Busy Beavers‘). One had to wait until ‘The Ugly Duckling‘, from the end of that year, to watch a Silly Symphony to feature a concise story from start to end. With its fourth Silly Symphony, ‘Hells Bells’, the Disney studio returned to the macabre that inspired the series’ very first entry. Set in hell itself, it starts with a fire, bats and a spider swooping into the camera, and images of the three-headed dog Cerberus and some dragons. The main part however is devoted to a large devil, surrounded by numerous smaller ones playing music and dancing to it. This section involves endless animation cycles. Luckily, there’s one great shot with a devil casting a huge shadow (looking forward to a similar, if much more elaborate scene in ‘The Goddess of Spring’ (1934). There’s also a great gag involving a crooked devil, and a weird one in which we watch devils milking a dragon-cow(?!). Despite its evil scenery, the whole atmosphere is remarkably merry. ‘Hells Bells’ is most noteworthy for its last part, in which the dance routine makes place for a tiny story, in which the large devil demands a smaller one to offer itself as dog food to Cerberus. The little devil refuses and flees, and finally manages to kick the large one into the fires of hell. Over the coming years, stories like these would overtake the song and dance routines of the Silly Symphonies, finally replacing them altogether.